The company has developed many kinds of infrared glass that permitting transmission of near-infrared light, mid-infrared light, far-infrared light at various bands. Where, the transmission band, refractive index of near-infrared and mid-infrared glass is 370nm～6.7μm, 1.52～1.99 respectively. Their glass systems include silicate system, germinate system, calcium aluminate system, lead germinate system, lead niobate system, etc. They are mainly applied to airborne infrared pods, vehicle mounted infrared detection(Observe, aim), and infrared fairing, infrared window of other near-infrared, mid-infrared instruments. At present time, the company owns mid-infrared IRG1XX series and far-infrared IRG2XX series, etc. Far-infrared glass is mainly applied to infrared detectors and devices at 8～14μm, and can be processed to far-infrared optical condenser lens with aspheric surface, components of prism group with spherical surface, glass windows. It can also be used as substrate material of external semiconductor GaAs, GaN or InGaN. Products are classified to mid-IR and far-IR optical glass according to the transmittance wavebands. IRG203 refers to infrared optical glass which has transmittance at far-IR waveband and the sequence number of it is 03. Infrared refractive index refers to the velocity of infrared light in the air as compared to that in the medium by the municipality. Deflection angle method is adopted to measure the incident angle i, refraction angle φ and vertex angle A. According to formula (1), we can obtain refractive index nλ of wavelength λ, and the measuring accuracy is ±1×10-4. A, B, C, D, E, F－Calculating constants. nλ(λ=3,4,5,8,10.6,12.5)—Infrared refractive index at specific wavelengths (μm). 2.3 Calculating constants of nabs. The refractive indices given in the glass handbook in general are all relative values at 22℃, but refractive indices in other temperatures are always requested by many optic designers. The absolute refractive indices of glass regards to wavelengths and temperatures which are not listed in the handbook can be calculated by the following equation (4). D0, D1, D2, E0, E1and λTK—Constants depending on glass types. The applied wavelength range: 1μm~14μm. Infrared transmittance is measured by Fourier transformation methods. Process the signals collected by detector through computer, we can obtain the infrared absorption spectrogram of which the light intensity changes with frequency. Measure dielectric constant according to the recommended methods for capacitivity and dielectric loss factor of electro-insulating material at power frequency, audio frequency and high frequency (including meter wavelength) in GB/T 1409-2006. In this handbook, chemical stabilities, thermal properties, mechanical properties and density are measured by the corresponding testing methods of colorless optical glass. Striae of infrared optical glass are inspected by the methods specified in GB/T 32561.2. The gray scale of shadow images and its area taking of the observable image are adopted for quantitative expression, and striae are classified into 4 grades as shown in table 1. Impurities in optical glass are inspected by the method specified in GB/T 52361.3. Impurity content is established by specifying the total cross sectional area (in mm2) of impurities (diameter Φimpurity≥0.1 mm) in 100 cm3 glass volume. The impurity grades are classified into 5 grades as shown in table 2. The cross sectional area of oblate impurity is obtained by the average value of the longest axis and shortest axis as the diameter. Blanks of various shapes (plain film, concave-convex part, etc.) are formed by reheated-press process. 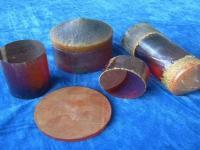 We can provide products with diameters ofΦ7mm~Φ200mm stably. Cold working lens refer to spherical, aspheric lens after coarse grinding, fine grinding, polishing or single point diamond turning. We can provide lens with diameters of Φ5mm~Φ160mm according to customers’ requirements. Precision molding lens refer to the products which are obtained by molding process. We can provide precision molding lens with diameters of Φ5mm~Φ25mm according to customers’ requirements. Lens with focal length of 3.5mm, 6.5mm, 10mm, 13mm, 15mm, 19mm, 25mm, 35mm, 45mm, 50mm and standard lens of other sizes are now available. Please contact the salesman for specific parameters. We can also design and manufacture other sizes according to customers’ requirements. If you have any special requirement on our products, please contact the salesman.